Boston Tennis Club members have helped Lincolnshire men win promotion to the Winter County Cup’s top flight. Meanwhile, the ladies’s team, also featuring members of the Sleaford Road Club, fought off relegation in their group. It was an exciting weekend as men’s and ladies’s teams competed in the Lawn Tennis Association’s competition at venues throughout the country. Lincolnshire’s men’s team included Boston Tennis Club members Will Mason, Dominic Beesley and Henry Beesley over the three-day competition. They played in Group Two at Grantham, whilst Victoria Beardsley and Lucy Hull played as part of the Lincolnshire ladies’ team at Taunton in Group Four. Boston Tennis Club hosted the Group Six ladies, which included Cornwall, Isle of Man, South of Scotland and the comparatively-local Northamptonshire side. This also proved to be a great competitive group. However, the focus was on Lincolnshire men who, on the first day, beat Berkshire 7-2. South Wales were beaten 8-1 next and finally a 5-4 success against Norfolk in an exciting finish placed Lincolnshire top of the table. They were promoted to Group One, the top group, where they will compete next winter. For the ladies, it was tough long journey to Taunton. 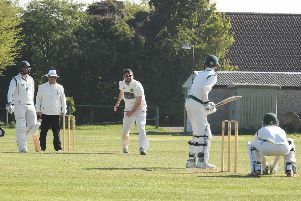 An opening-day loss to Buckinghamshire (3-6) was followed by defeat at the hands of Wiltshire. They rescued the situation on the final day with a 5-4 win over Berkshire. The teams consist of six players from a squad of nine, who played six singles and three doubles. After the singles it was 3-3, before Lincolnshire won two of the doubles on third-set tie-breaks, one of them involving Hull, which was a 21-19 scoreline. This was enough for the ladies’s team to stay in group four. The Boston group was decided on the last day with three of the counties locked on two wins. However, Cornwall claimed first place.